Built right on the lake, the old cottage (bottom) was badly rotted. Handsome windows and new fiber-cement siding (top) improved its looks. The first thing we noticed was the smell of rot. But second was the view: Set right at water’s edge, the little lake cottage felt as though it were afloat. Our agent had just let us in; 24 hours later, the house was ours, rot and all. 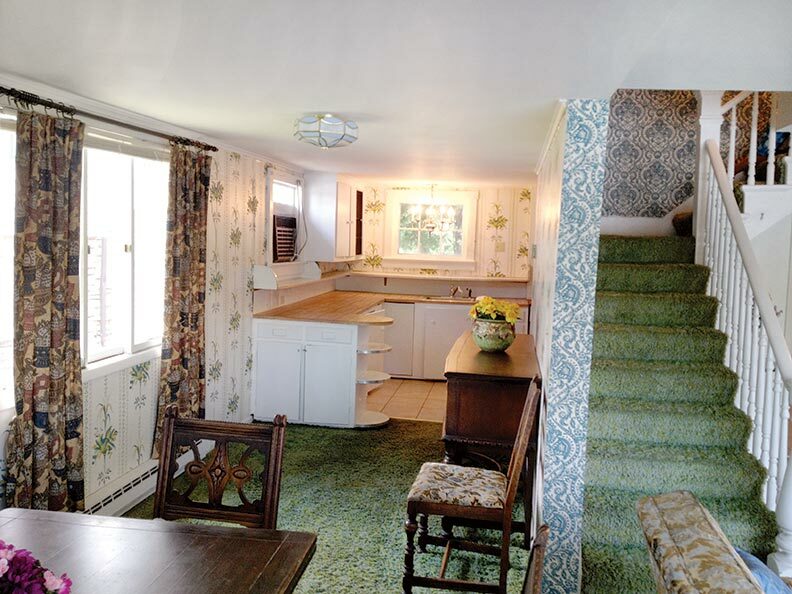 Uninhabited for a decade, crammed with showy 1970s wallpapers and shag carpeting, the cottage nonetheless possessed a grubby charm. The staircase seemed to promise that something good (and old) lay beneath the groovy décor. Although we’d been given a build date of 1938, the staircase’s three different newel posts and fanciful trim suggested the cottage was earlier. The upstate New York lake had been a “pleasure resort” at the turn of the last century. Old postcards show a rambling hotel and a shoreline dotted with buildings—tiny, ornate Victorian camps like you’d see at Oak Bluffs on Martha’s Vineyard, and relaxed Arts & Crafts cottages and rustic fishing shacks. 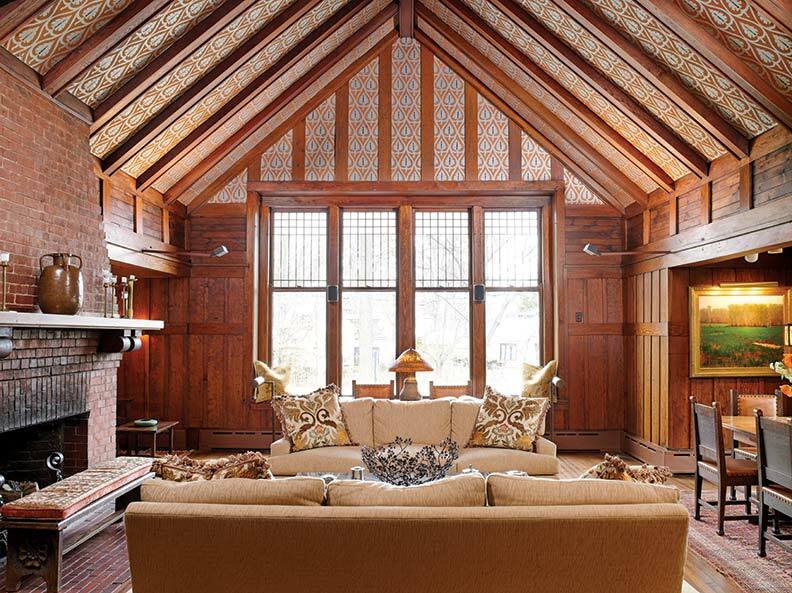 We were eager to restore our blandly modernized weekend cabin to its period charm. But which period? 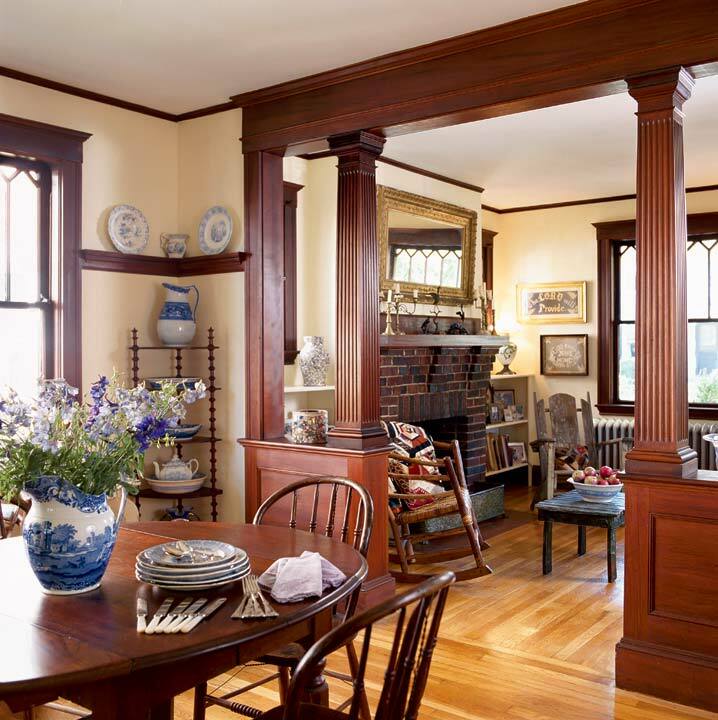 We ripped up the filthy carpeting and peeled layers of mildewed wall materials back to the studs, gradually discovering that the original structure was a petite Victorian cottage with open porches on two sides. 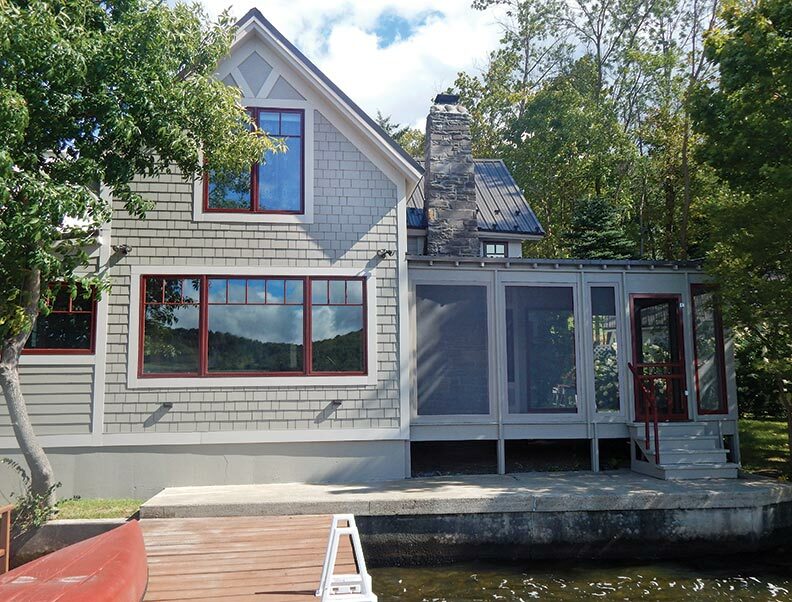 The siding and windows were pre-painted at the factory in colors selected by the homeowners. The ghosting of sawtooth trim and a handrail in the front bedroom upstairs pointed to a sleeping porch. Interior walls were banged together with a miscellany of wood, from timber with bark intact to sections of packing crates. At some point the porches were closed in, and nondescript windows and doors replaced the originals, erasing Victorian character. Our cottage was not alone in its fate; none of the delightful Victorian camps remains. Among the vintage structures that do survive, most have a comfortable Arts & Crafts vibe, so we adopted the later aesthetic. Decisions were further determined by the lakefront location. The entire front exterior wall had rotted over the years; boat traffic and severe weather cause water to smack the break wall, splashing the cottage. Upstate New York winters are severe; the lake freezes so hard, motorcycle races are held on the ice. We elected to renovate our seasonal house using sturdy synthetic materials. The interior isn’t finished yet—but it already looks a lot better than it did in the shag-carpeted glory days! We used different types of Hardie cement-board siding to narrate how the structure had evolved over time. The original 1890s cottage is now shingled, and its later additions are clad in lap siding. 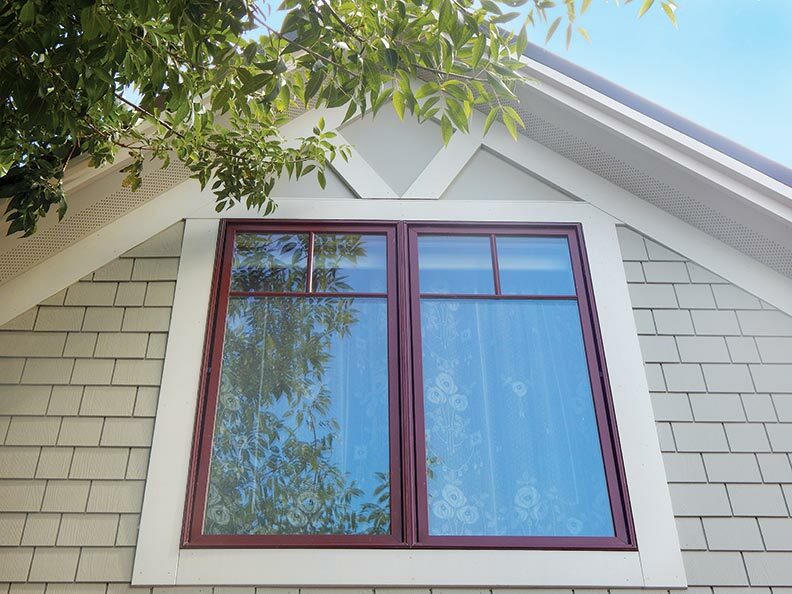 New windows are Pella’s EnduraGuard aluminum-clad wood. We chose factory-finished colors for all products: Pella’s Brick Red, and Hardie’s Monterey Taupe for the body with Cobblestone for trim. Benjamin Moore reproduced those colors for painting the screened porch. 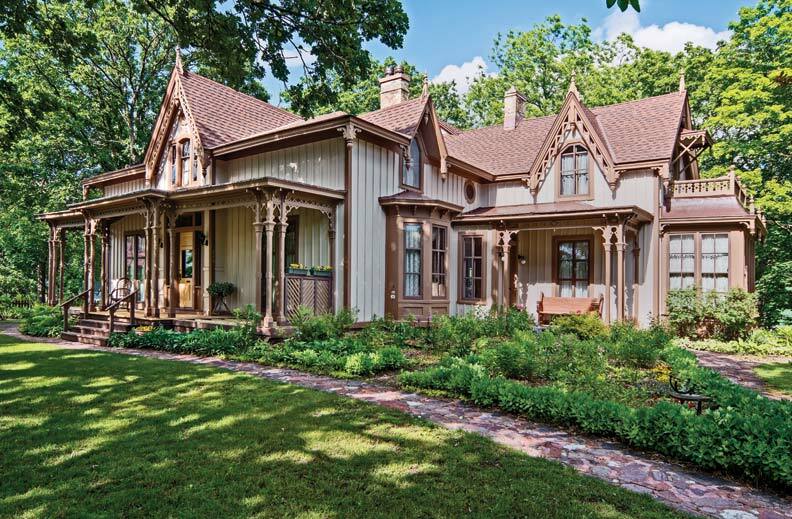 A new standing-seam steel roof caps the project with vintage charm.